The requisite Bugaboo Frog post. No matter where I go, if I’m out with my baby in the Bugaboo Frog, someone will stop me and ask about the stroller - every single time. And there’s a reason. It’s the best stroller available. It turns on a dime, our car seat attaches to it, and it converts from a bassinette to a regular stroller once your child grows up. We even used the bassinette in our bedroom as Madame’s bed until she moved to the crib. 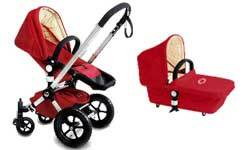 Plus it looks cool and is the one stroller every dad would be happy to use. There are plenty of places you can find where people talk about how awesome their Bugaboos are, and I don’t have much to add here. Below are some links to finding out for yourself how much the Bugaboo Frog will totally rule you.